What the Australian balladeer John ‘True Blue’ Williamson would like to see. . . The nature of Australia being represented on our nation’s flags is something I have always been very passionate about. I have dreamed for many years that our nation’s banners celebrate our most important heritage: the nature of our ancient island continent. If my dream of purely Australian flags is seen to be anti-British then I am sorely misunderstood. Our British heritage is securely placed in Australia’s hereafter. The State names: Queensland, New South Wales, Victoria, and main streets in our cities: George Street, Elizabeth Street, Edward Street, etc, will always preserve the fact that the Australian nation was founded by the British Monarchy. Not to mention the hundreds of towns and suburbs named after the same in the British Isles. I believe that those who cling to the Monarchy and the Union Jack are no different (comparatively) from those in the late nineteenth century who objected to the then proposed Federation and the change from the Union Jack to a British ensign. In other words, there is no doubt in my mind that a Republic is inevitable as is a purely Australian flag. So it is important that we keep the debate open to get the right kind of Republic and the best possible flags. Since 1982, I have designed alternative national flags to display on stage to my audiences and have always invited constructive criticism. 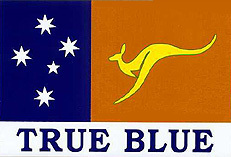 My conclusion is that most Aussies want at least the Southern Cross on a blue background (for many good reasons). However, the stars do not indicate what country in the continent. Southern Hemisphere the flag refers to. The coat of arms, the penny, the airforce, the army, and national football teams have confirmed what is surely the Australian icon. Like two boomerangs, the sweep of the legs and tail of the launching kangaroo can be recognised at a great distance. The 4 million year old marsupial symbolises our ancient island continent. And finally, a kangaroo cannot go backwards. ‘OUR LAND ABOUNDS IN NATURE’S GIFTS OF BEAUTY RICH AND RARE’. The state and territory flags, in the Northern Territory tradition, could follow suit to celebrate our diverse natural heritage. At last we are recognising the aboriginal spirit of our land. By combining red, black and gold with the kangaroo and the Southern Cross we symbolise a unified nation. I hope you like my contribution to the ‘Glory’ of independent Australia.